The Dirt Devil Vibe stick vacuum features a lightweight design for easy portability for all your small messes. With on/off brushroll you can conveniently move from carpets to hard floors at the touch of a button. The brushroll helps to agitate carpeted surfaces and straight suction is perfect for hard floors. An easy empty dirt cup allows you to dispose of the dirt mess-free. Quick Release Cord - readily release the cord for everyday cleaning needs. Detachable Handle - the handle detaches easily and efficiently for lightweight stair cleaning. I'm very disappointed with this product! I wished I spent my money on a different and better product. The stick falls out all the time, and the suction power is not sufficient at all. I love dirt devil I think they offer a well made product for the money.I have another product that still works but, I can't get parts for it because its so old. and it still works fine. Tried panasonic and it was a waist of money.and electrolux also and never was happy. So I will stay a dirt devil customer from now on. Lightweight and easy to dump. Power wheel on front really cleans. Perfect for quick pick ups. I keep mine in my master bath closet to keep my floor clean of hair. Works great! Sue F.
Does just what I wanted it to do, picks up dog hair off my hard wood floors. 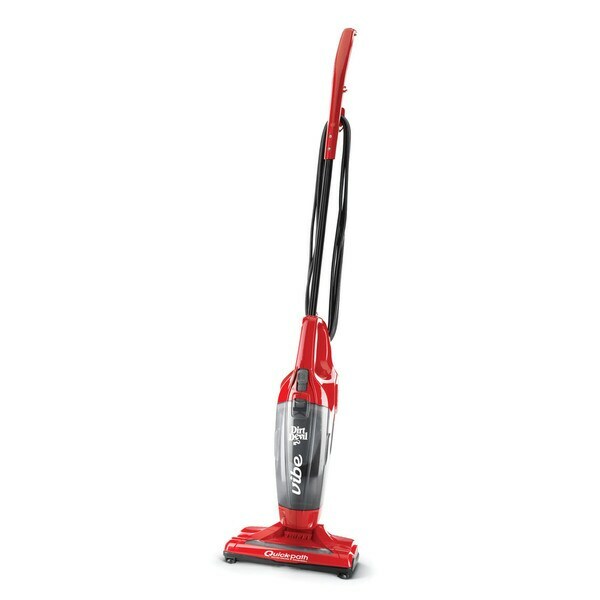 Cheap little vacuum with no suction power to ever pull up dirt off of tile. Don't wastree the money. The first 2 times I used this little vacuum, I was psyched. It's lightweight and very easy to maneuver. But then it completely stopped sucking anything up. I returned it. Don't waste your time or money. other one i had stopped working after 15 years. Recommendations were good, I needed something to vacuum steps.